Kneidl -- Rita M. Kneidl, nee Hicks, beloved wife of the late Leonard J. Kneidl; beloved daughter of the late Matthew C. and Della Madigan Hincks; fond sister of the Late James and Francis Hincks; dear cousin of John Hincks. Funeral Monday, 8:45 a.m., from Blake-Lamb Funeral Home, 5800 W. 63rd St., to St. Catherine of Alexandria Church. Mass 9:30 a.m. Interment family lot. Visitation after 3 p.m. Saturday. 735-4242. [S1396] Chicago Tribune, February 8, 1954, ProQuest Historical Newspapers, Chicago Tribune (1849-1987), accessed June 1, 2011. [S1346] Cook County Clerk's Office, online http://www.cookcountygenealogy.com, Kneidl-Hincks Marriage, accessed June 2, 2011, certificate #2235442. [S1397] Chicago Tribune, April 12, 1918, page 11, ProQuest Historical Newspapers, Chicago Tribune (1849-1987), accessed February, 2011. [S309] US Social Security Death Index, 1935-Current, Ancestry.com, Rita Kneidl, accessed June 2, 2011. [S1346] Cook County Clerk's Office, online http://www.cookcountygenealogy.com, Kneidl-Hincks Marriage July 12, 1952, certificate #2235442, accessed June 2, 2011. [S1398] Chicago Tribune, December 10, 1977, page 19, ProQuest Historical Newspapers, Chicago Tribune (1849-1987), accessed June 1, 2011. [S1767] Christine Ostrowicki McKenna, "McIntyre - Sullivan Family History," e-mail to Elaine Beaudoin, July 11, 2013. Marriage*: He married Marcella Connor before 1967. Death*: Julia died on 27 February 1934 at St. Bernard Hospital, Chicago, Cook County, Illinois, USA, at age 53. 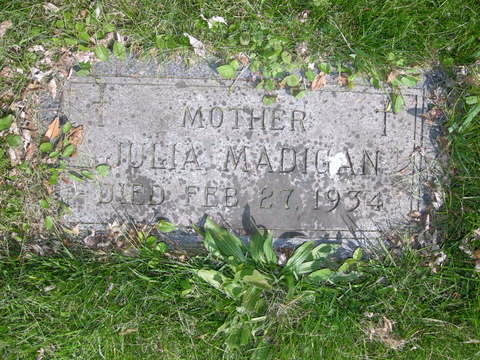 Madigan -- Julia A. Hoey Madigan, beloved wife of Maurice, fond mother of Colette (sic), Hoey, and Marge, daughter of the late James and Margaret Hoey, sister of John, Mrs. R. J. Barry, and Anna Hoey. Funeral Friday at 9 a.m. from her late residence 7118 S. Campbell av. to St. Adrian's church. Interment Holy Sepulchre cemetery. Steward 7700. [S524] 1920 US Census, Illinois, Cook County, Chicago, Washington, DC, ED 1886, sheet 2, line 73. [S850] Julia Madigan, Illinois certificate of death, Micropublication #1894005, Family History Library, Salt Lake City, Utah. [S524] 1920 US Census, Illinois, Cook County, Chicago, Washington, DC, ED 1886, sheet 2, line 73, Newberry Library, printout dated May, 1999. [S859] Madigan-Hoey Marriage License: Micropublication #1030432, Family History Library, Salt Lake City, Utah. [S863] Marriage Register: entry for Maurice Madigan & Julia Hoey, November 26, 1907 Visitation Catholic Church, Chicago, Illinois, Family History Library, Salt Lake City, Utah, MF #1752989. [S795] 1930 US Census, Illinois, Cook County, Chicago, Washington, DC, ED 690, page 8A, Ancestry.com, accessed December 18, 2007. [S1400] Chicago Tribune, May 1, 1934, page 18, ProQuest Historical Newspapers, Chicago Tribune (1849-1987), accessed June 1, 2011. 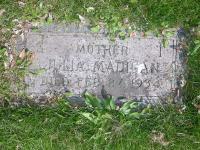 [S1184] Maurice Madigan cemetery record, Holy Sepulchre Cemetery, Alsip, Illinois. [S974] Baptismal Register, page 305, Rita Lillian Hofelt, Baptimal Record: Family History Library, Salt Lake City, Utah, MF#1703795, Item 3, June 22, 1913, St. Malachy Church. [S1933] Illinois, Cook County Birth Certificates, 1871-1940, Index, online www.familysearch.org, Robert E. Kenney, 16 Jun 1900, certificate number 248774. Accessed FamilySearch.org, March 12, 2019. [S2371] St. Patrick Church, Chicago, Illinois, "St. Patrick Church Records," Baptismal entry, FamilySearch online, accessed prior to March 24, 2014, provided by Brittney Reyes., Elizabeth Hogan. [S2371] St. Patrick Church, Chicago, Illinois, "St. Patrick Church Records," Baptismal entry, Information provided by Brittney Reyes, March 24, 2014., Elizabeth Hogan. [S717] Chicago Tribune, June 17, 1959, Part 3, Page B12. Father: Peter A. Hohs1 b. c 1881, d. 1 May 1935? [S744] 1910 US Census, Illinois, Cook County, Niles Township, Washington, DC, ED 58, Page 14B, Accessed November 5, 2006, Ancestry.com. [S745] Chicago Tribune, December 13, 1967, Page C14, Accessed November 5, 2006, ProQuest, Chicago Tribune Historical Archives. [S1413] Bureau of Vital Statistics entry, Cook County birth registration, Ancestry.com, accessed October 26, 2011, Applonia Hohs birth record, FHL#1288190. [S1413] Bureau of Vital Statistics entry, Cook County birth registration, Ancestry.com, accessed October 26, 2011, Elisebeth Hohs birth record, FHL#1288159.